Prime your next painting project for success with our recommendations for the best paint to use on wooden surfaces throughout the home. Q: A few wooden surfaces in my home interior could use painting. What’s the best paint for wood—water- or oil-based? And what sheen do I want? 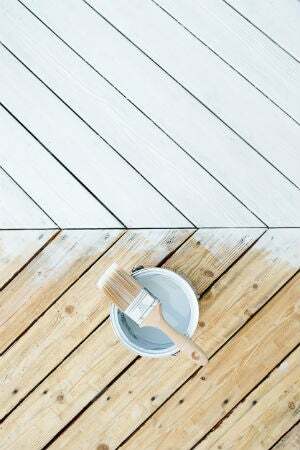 A: Wood is adaptable enough to receive either water- or oil-based paint, as long as you coat it with primer beforehand. But the myriad types of paint and sheen within these two categories can present you with a dizzying array of options at the paint store. Ultimately, the best type of paint and sheen to use depends on the wooden surface you’re painting. So, read on to learn which of the most common types of paints and sheens on the market are best suited for your wood painting project. Get to know paint options and their sheens. Water-based paint is sold at paint stores and home centers in traditional latex ($15 to $40 per gallon), milk ($15 to $25 per quart), or chalk varieties ($15 to $35 per quart), while oil-based paints are either alkyd-based (made with synthetic resins called alkyds; $20 to $50 per gallon) or plant-oil-based (made with linseed or other plant oils; $30 to $50 per quart). Traditional latex, alkyd-based, and plant-oil-based paint also come in a number of sheens—flat (matte), eggshell, satin, semi-gloss, and high gloss, in order of lowest to highest luster. You can expect to pay one to two dollars more per gallon for every step up on the sheen spectrum. Milk and chalk paint, which you can buy or DIY with good results, are naturally matte, so commercial cans of these paints don’t usually indicate a sheen. Pick a stain-blocking primer for your wood, no matter the project. 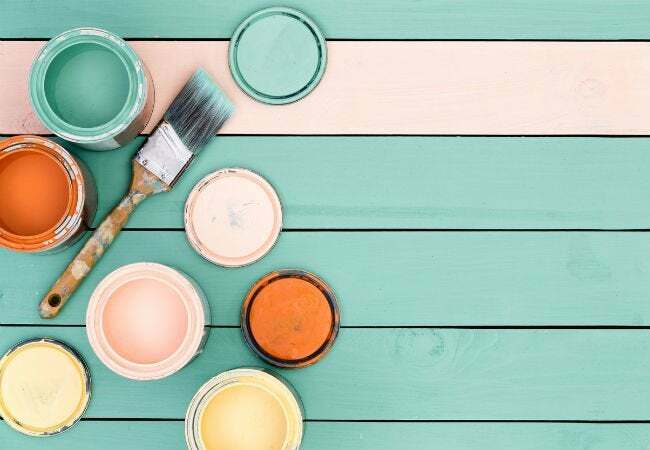 Whether you’re painting unfinished or painted wood, it’s essential to prime it before painting since tinted organic compounds in wood called tannins will otherwise bleed into any water-based paint applied on top—especially when painting over dark, tannin-rich woods like knotty pine. Primer creates a barrier between wood and paint that prevents this tannin bleed-through. While oil-based paint is less susceptible to tannin bleed-through, primer (which runs $16 to $25 per gallon) is still recommended under all paints to ensure an even foundation that will help you achieve a more uniform paint finish. So, choose one that matches the type of paint you’re using: stain-blocking latex primer for latex paint and stain-blocking oil-based primer for oil-based paints. How knotty your wood is may guide you in deciding which types of primer and paint you use, as oil-based primers (like the paints) do a better job penetrating and sealing the wood and block tannins more effectively than water-based primers. 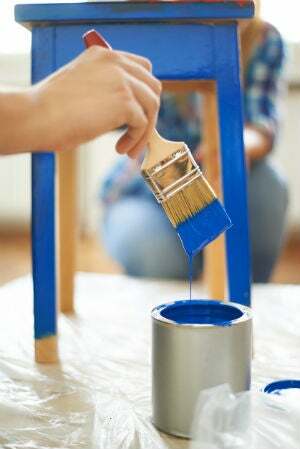 Use traditional latex paint on seldom-used furnishings. This water-based paint is a top choice for infrequently-used furnishings (e.g. entryway tables or stair spindles) since it can be tinted to match any color you desire for the furniture and dries faster than oil-based paint. (For reference, latex paint coats normally dry to the touch in one to four hours as opposed to eight hours or more for oil-based paint coats.) Latex paints today are also cheaper, lower in volatile organic compounds (VOCs), and less likely to show pesky brush marks seen on alkyd-based oil paint coats. Within latex paints, those with a flat to satin sheen reflect less light than glossier sheens, meaning that completely smooth coat masks furniture flaws (knicks and scratches to be painted over) more effectively. They’re also the most inexpensive sheen options for furniture you don’t handle often. Use chalk or milk paint for distressed furnishings. These decorative water-based paints are known for their elegant shabby-chic look and matte sheen, making them an attractive option for furnishings that would benefit from a distressed look. Milk paint cracks, flakes, and distresses easily, which gives it a more pronounced weathered look that’s ideal for focal point pieces like wooden hutches or headboards. Chalk paint less easily distresses on its own, giving you more control over the distressed effect and usually resulting in a softer, more subdued aged effect that’s perfect for items that complete a room such as end tables or wooden coat racks. Consider alkyd-based oil paint on everyday furnishings. It dries into a rigid layer over wood and continues to harden on the wood surface over time, making wooden chairs, dining tables, and other frequently-used furnishings less susceptible to scuff marks or dents than the soft, more flexible surface of a water-based paint coat. Alkyd-based paint dries faster than plant-oil-based paint (some plant-oil-based paints take up to three days to dry)—meaning the furniture you use most won’t be out of commission drying for as long as it would be with a plant-oil-based paint. Opt for semi-gloss or high-gloss sheen; these are the smoothest to the touch and the easiest to wipe clean. These sheens also hold up better to harsh cleaners and scrubbers, which may tarnish a lower luster paint coat. Select alkyd-based oil paint for kitchen and bathroom cabinets. These cabinets are exposed to considerable moisture from water or cooking fumes, which are absorbed over time to a greater degree by the average water-based paint, and can spur the growth of mildew or mold on the cabinet surface. Oil-based paint is water- and rot-repellent. Use an alkyd-based paint instead of a plant-oil-based paint on moisture-exposed cabinets since it’s less likely to turn yellow over time—a downside of plant-oil-based paint. Semi-gloss or high-gloss paint sheens are your best bets; their non-porous, smoother finish is easier to clean, and moisture beads on these surfaces rather than being absorbed, so the paint coat doesn’t weather or fade with time. The exception is shelves in the cabinet interior; if you opt to paint these, you want a flat to satin sheen because they’re better at withstanding the weight of dishes. Cover cabinets in dry areas of the home with traditional latex paint. It’s the most inexpensive and fastest-drying option for cabinets that live in spaces where moisture isn’t a concern—say, in a home office or entertainment room. A flat to satin sheen is best for cabinet shelves, especially those that carry electronics or other heavy objects, but choose a semi-gloss to high-gloss sheen for the cabinet exterior to make lighter work of cleaning it. Use alkyd-based oil paint on standard trim. Interior trim—whether baseboards, door casings, or window or ceiling trim—accumulates a fair amount of scuff marks and dents or dings over time. The rigid quality of an oil-based paint coat defends against these flaws more effectively than a softer and less durable water-based paint coat. Trim being a noticeable feature in the home interior (particularly when set against white walls), you’ll want to choose an alkyd paint over a plant-oil-based paint to avoid the risk of yellowing. As with cabinets, choosing paint in a semi-gloss or high-gloss sheen makes the job of cleaning dingy trim easier. Use traditional latex paint on ornate trim. Decorative trim—for example, a crown molding with scrollwork (spiral-shaped pattern)—often contains grooves that oil-based paint has trouble reaching into and coating since it’s thicker and more viscous than water-based paint. The lower viscosity of water-based paint makes for a thinner paint that more readily reaches grooves and recesses in trim, getting you more uniform paint coverage. A flat to satin sheen is the most inexpensive option for ornate trim in low-traffic areas you don’t need to clean often. For floors, use alkyd-based oil paint. It can handle daily abuse from boot heels, sopping shoes and umbrellas, and furniture relocations without becoming water-damaged or dented. (The softer, more flexible surface of a water-based paint coat doesn’t hold up as well on painted wood floors in high-traffic zones.) While plant-oil-based paint also offers these benefits, it’s too cost prohibitive for most homeowners to apply to the large surface area of a floor. Choose a semi-gloss or high-gloss paint finish; the surface area of a floor is more labor-intensive to mop up if you’re working with a coarser flat to satin sheen. Pick plant-oil-based paint on small knickknacks. It’s gone out of favor for more affordable and readily available alkyd-based oil paints, but this type of paint is still used to augment the natural patina of small wooden objects—think wooden jewelry boxes, photo frames, and other surfaces where its steeper price isn’t cost-prohibitive. Since plant-oil-based paint dries into a slightly softer and suppler surface than alkyd-based oil paints, the wood surface can expand and contract with temperature changes with little risk of the paint coat turning brittle and cracking. Moreover, since the paints are usually comprised only of plant oil, oil drying agents, and natural pigments, they emit little to no VOCs into your household. A semi-gloss to high-gloss sheen reflects more light so makes small objects stand out better than a lower luster sheen would allow.